We have been in Mumbai 8 years now. And we love travelling, as is evident by this blog. So it was like a black mark on our wanderlust credentials that we hadn’t yet visited Gir National Park, which is practically next door in Gujarat. To be fair, although Gujarat sounds closeby, Gir is about 800 km away by road from Mumbai – because the road skirts all the way around Gulf of Khambat. Same with trains. And with only a single train to Junagadh (closest railway station) from Mumbai, tickets are always in short supply. Summer season is ideal for wildlife holidays for 2 reasons. Animals are more thirsty and come to watering holes to drink water more often, increasing sightings. Secondly, the forest dries up and becomes sparse, making it easier to spot animals inside the forest. But at the same time, one has to face the uncomfortable heat in open topped jeeps. But we think this much sacrifice for good sightings is well worth it. It was too late to get train tickets, hence flights were the only option. Junagadh is the closest airport, but there is only one flight daily from Mumbai and it was about 9,000 one way. Rajkot, about 3.5 hours away from Gir has more flights and tickets were around 4,000 one way. We got early morning tickets to Rajkot on Friday morning and return tickets for Sunday evening. The flying time is just 1 hour, so at 7.30 am on Friday, bleary eyed, we were at Rajkot airport. Google helped find some travel operators in Rajkot who were offering very reasonable rates to transfer from Rajkot to Gir (Mayank Travels, +91 9033338128). The only downside is that you have to pay to and fro fare instead of one way – because the Rajkot vehicle will drop you at Gir and return back to Rajkot. Airport pickup via hotels follows the same policy, and their rates are higher. The vehicle and the driver we got were both good and professional. We stopped outside Junagadh for breakfast around 9am. We both had been comfortably snoozing in the back till then. Roads were quite decent in Gujarat, as we know from experience. There was some traffic, but nothing excessive. It took 4 hours to reach Sasan Gir (entrance to Gir National Park), including the half an hour for breakfast. Having requested an early checkin at the hotel, we soon found ourselves in our cozy room. After lunch, we turned up at Sinh Sadan for our 3pm safari. Gir has 3 safari slots in a day (unlike 2 in tiger reserves). 6-9 am, 9am-12pm and 3-6pm. For Friday we had prebooked the afternoon safari on the Gir website, so all we had to do was to goto the separate online counter, get a route number, a vehicle and a guide allotted. It is a quick process and doesn’t take more than 5-10 min. There are 7 routes inside Gir and we got allotted Route 6 that day. The safaris were delayed a bit (15-20 min) on account of the summer heat. We finally got underway at around 3.20 pm. 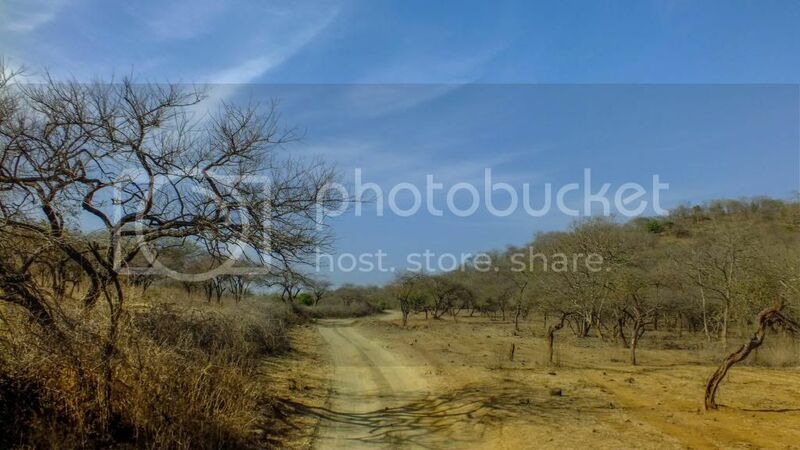 There is an old road that cuts through Gir –it is unpaved, but it is a public road – meaning vehicles other than safari jeeps can travel on it. Google Maps shows it as SH 111. 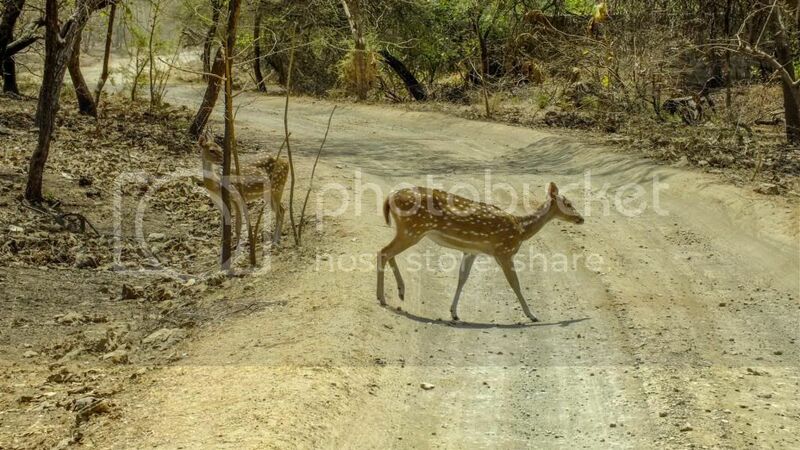 The entrance to Gir is via that road – till we turn into the actual forest. 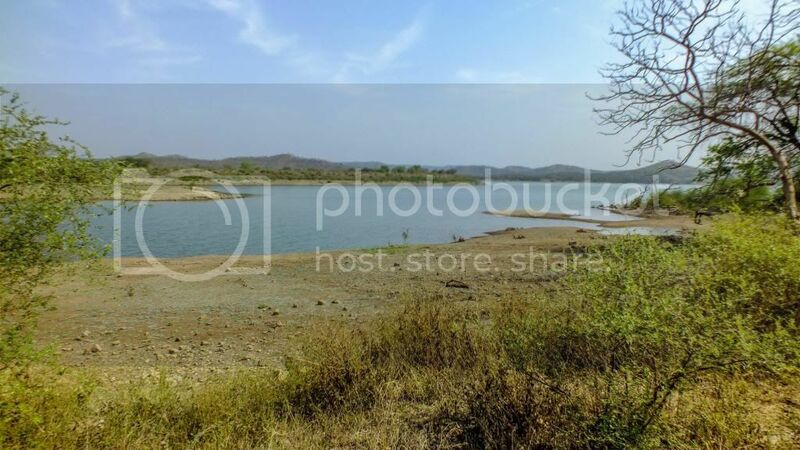 Gir is described as dry deciduous forest. In mid April, the forests were completely dried up with most trees having shed all their leaves. Only ber trees and a couple of other varieties were green. The first animal we came across inside Gir was a peacock. Closely followed by a deer. Gir seems to have overwhelming numbers of the latter – more than 60,000 antelopes in Gir. Peacocks are also numerous and the dry brown yellow background provided a marvellous contrast to the brilliant blue of the peacock. Literally every time we saw a peacock closely (and they were innumerable), we sighed at their spectacular colours. 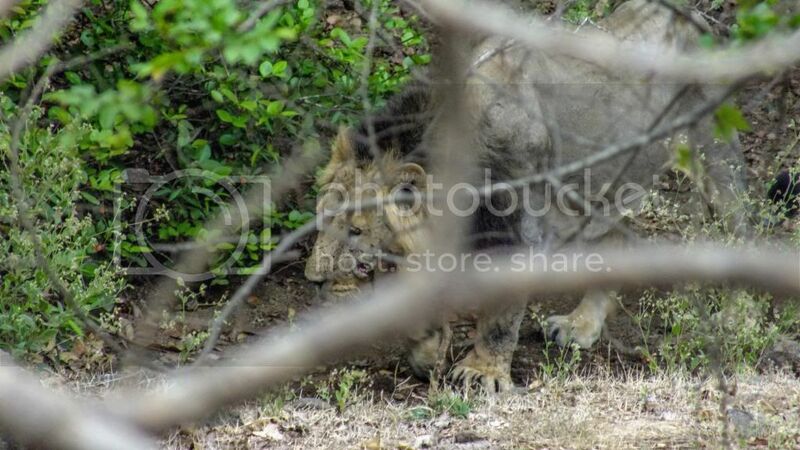 A family of 4 lions – a male, a female and 2 grown up cubs. Resting under the shade in a dry riverbed – possibly somewhat cooler because of the water below. The adult lions did not stir, except their tails which swatted flies every once in a while. The cubs were a little more active, rolling around and looking at the ever increasing number of jeeps. Finally, when there was a danger of a traffic jam because of so many jeeps converging on the narrow jungle road, our driver moved out. Our guide was a birder – and he pointed out some interesting birds to us. Some of which we could have never in our lives managed to figure out, even staring at it for half an hour. But this dude, in a jeep doing 30-40 kph, in a dusty road, would spot brown owls sitting high up in a brown tree !! Nevertheless, towards the end of our safari, we came across another conglomeration of jeeps. 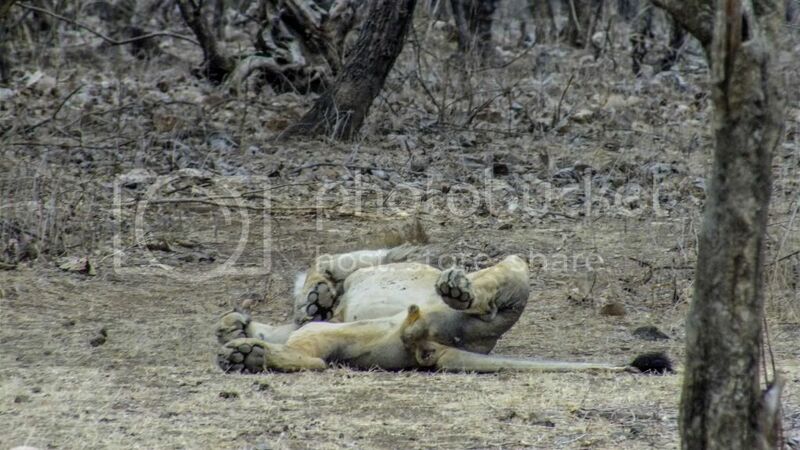 Turned out, it was an artificial waterhole, and a lioness was sitting on the other side. And keeping us pesky tourists from taking a good photo of her. The lioness was barely 15m away, so it was very thrilling. We kept silently imploring the lioness to stand up, and give us that full view, but all she did was raise a fraction of her head to see the crowds waiting for her, before hiding down again. After the break, the guide was quite optimistic about sighting a leopard, since leopard uses the afternoon time, when lions are snoozing, to do its hunting. Leopards are notoriously shy, but it was our lucky day. 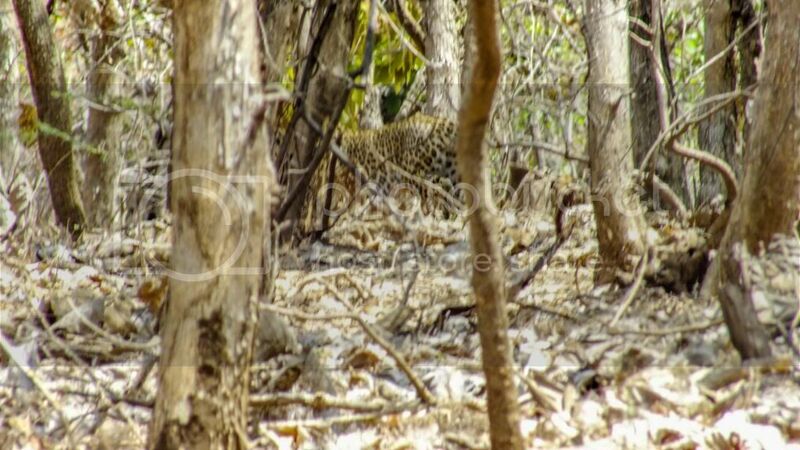 It was an open part of the forest, with not many trees close to the road, when the guide excitedly yelled “leopard”. The animal was somewhat far from the treeline when the guard first spotted him, but he slinked away into the trees so fast I couldn’t focus my camera to get a proper shot. Pleased as a punch that we saw a leopard – we were the only jeep who saw it – we exited out of the same gate as the one we had entered from. 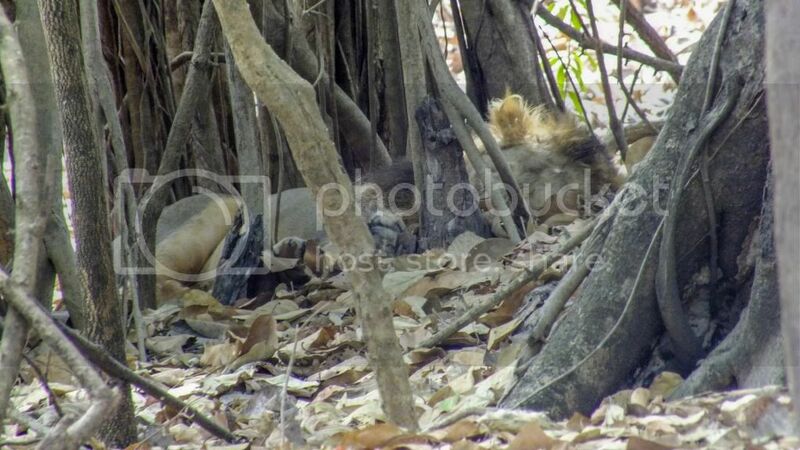 And the sleeping lion was still sleeping. Back in the hotel, we jumped straight into the pool – although with the strong sun, we couldn’t stay for too long. Then it was lunch and a nap. We explored the option of visiting Somnath temple nearly (55 km away) but since neither of us are extremely religious and the current temple was built only in the 1950s, we skipped it. We thought of going to Diu instead (100 km away), but skipped that too because it would become quite a chore with 2 hours of travel both ways . Instead, we booked a massage each at the hotel’s spa. Turned out to be a very good idea as a good massage did wonders rejuvenating the tired body. Although the spa was quite expensive – it was a little more than average Bombay rates. For something far flung in the middle of nowhere, rates should logically be lower. 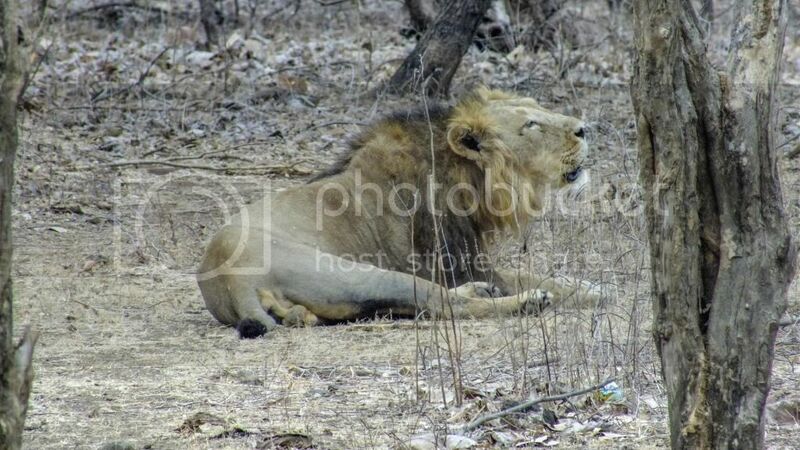 For the final day, Sunday, we had again managed only the 9am-12pm slot online - which we were loath to do since lions mostly slept during that time. And all guides had reiterated that the morning 6-9am slot is the best because lions can be spotted doing some activity instead of lying around. Hotels can supposedly arrange for safaris in any slot you want, but it would be a costlier option. And we felt we should to do a morning safari just to cover all the bases. Finally desire won, and we asked the hotel to help us. The hotel was thankfully able to secure a shared jeep for us ! As the sun rose and it became hotter, there were no more lions to see. 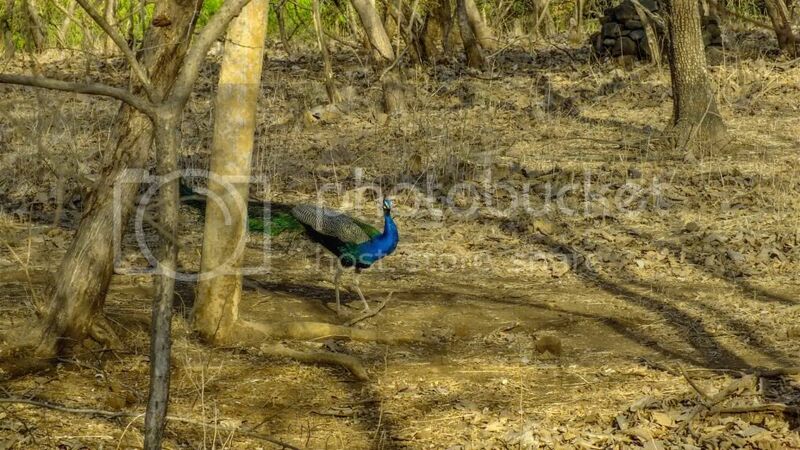 The second half of the safari was mostly deer, some langurs, sambhar, nilgai – and of course, peacocks. 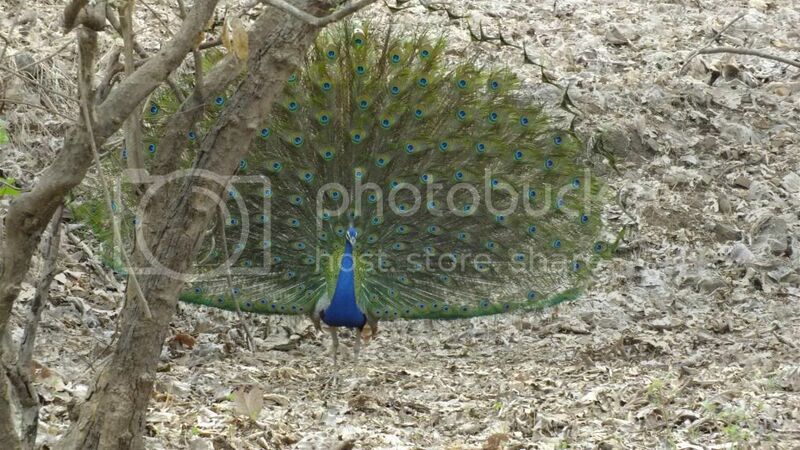 We were lucky to witness a full dance by a male peacock – the gorgeous spread of his feathers as he strutted around. Out of the available safari permits for each timeslot, half are sold online and the other half are given on first-come-first-served basis before the safari. Like railway tickets, you are supposed to line up in front of the ticket counter in Sinh Sadan. Availability becomes scarce on weekends and holiday days like Good Friday, when a lot of people turn up. Online permits are sold out weeks in advance and there is a huge queue at the spot counter. For a 6 am safari, you are expected to line up all through the night to be among the successful ones ! We are not kidding. It is the same story with all tiger sanctuaries as well. However, there is remedy available in form of agents, who will stand through the night “for you” and you go and replace them at 4-5 am. These agents charge anything from 500-1500, depends on your bargaining. Alternatively, you can ask the hotel and they will get agents to stand on your behalf. You'd have to get up at 5am and join the queue. And there is not much scope of bargaining with a fancy hotel – so you have to pay 1500 usually. We did the same as above. We asked the hotel and they managed the morning safari. Where you can save money is by asking the hotel to combine you with some other group from the hotel if there is another couple or couple + 1 kid. In our case, we shared the jeep with a family from Rourkela who had two small kids. The safari cost including the agent came to 4,000 which was split half between us and them. 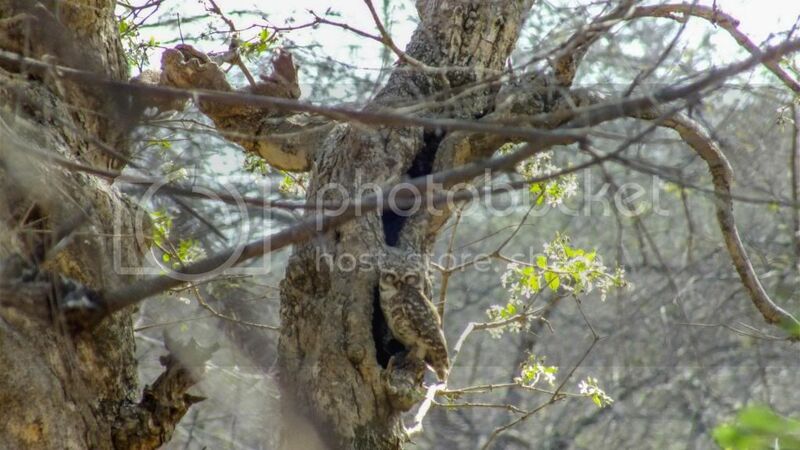 All hotels are spread around the Sinh Sadan forest office at Sasan Gir. 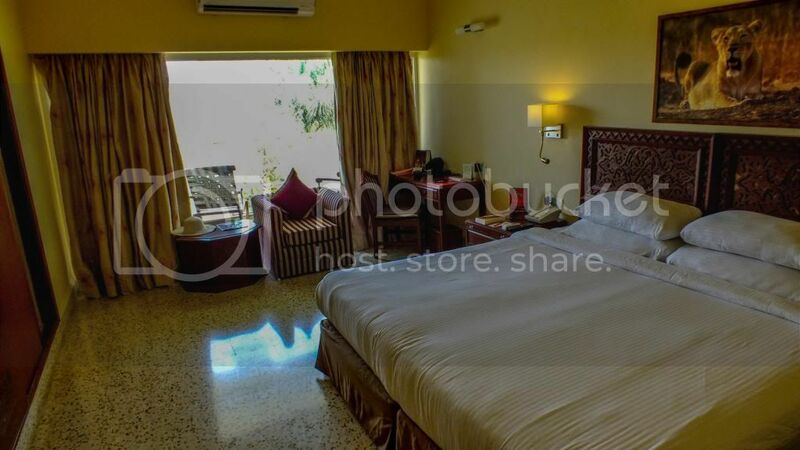 There are a lot of hotels there (including Sinh Sadan guest house of Gujarat Tourism) – and they cater to all budgets. We were looking for a nice de-stress and chose The Gateway Hotel. Part of the Taj group, it lives up to its group name – splendid location on the Hiran river, and very well maintained resort. Each room came with a big balcony and a view of the river - rooms themselves were humongous. And the swimming pool proved to be a godsend after each dusty safari. We had a 6.00 pm flight from Rajkot on Sunday evening, so we decided to leave Gir by 12.30pm. And since we hadn’t had the opportunity to have a Gujarati thali so far on the trip, we asked the driver to take us to an authentic Gujarati thali place. He took us to a decent lunch home kind of place in Junagadh, where we hogged on a very good thali. Surprisingly, it wasn’t as cheap as I expected. Great post! And lovely pictures! Enjoyed reading it....we went to Gir a month after you posted the blog. Superb experience. We were especially lucky with leopards.....saw 5 in a day! You have travelled MUCH more than us and your writing is great to read. 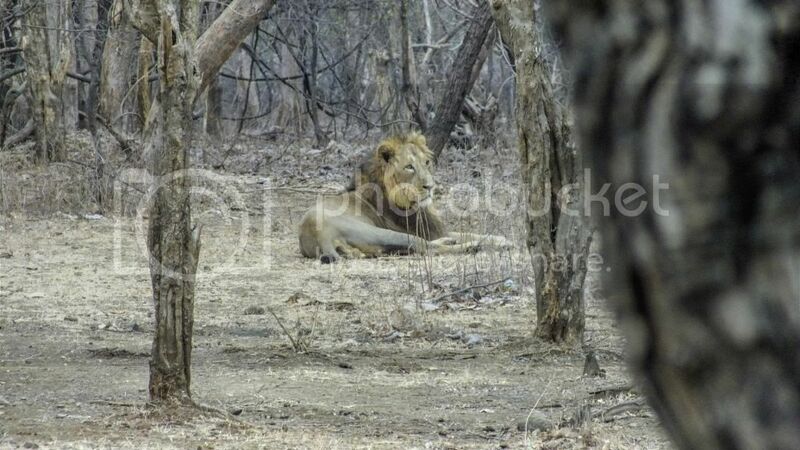 Gir is most famous for its lions, the park is one of the most diverse places in Gujarat, both in flora and fauna. 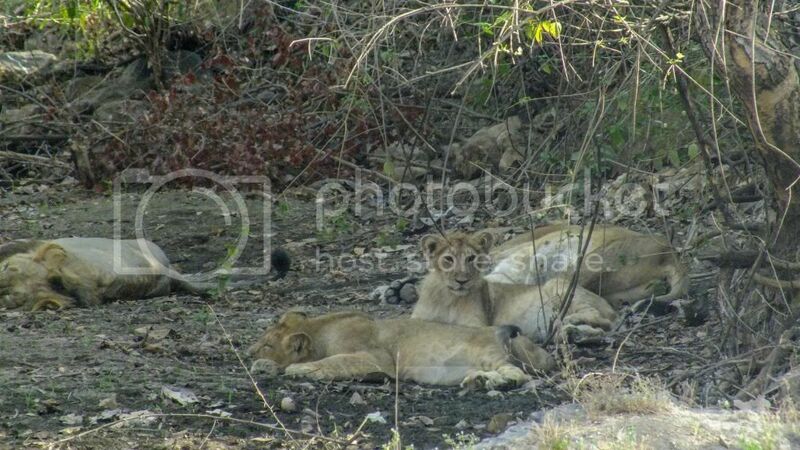 Many tourists come to Gir because, outside of Africa, it is the only place with wild lions and for many travelers who prefer to stay at hotels in Gir forest. Really very nice post. Keep posting. 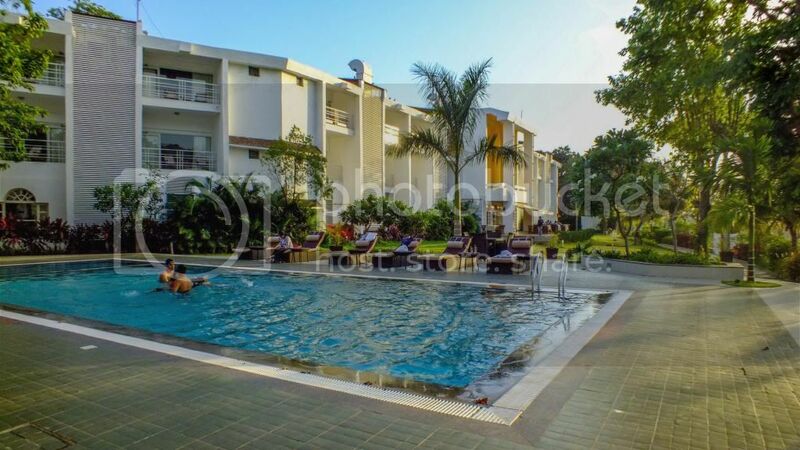 Find some affordable resort in Gir. Thanks for posting your experience in great detail. I just have a basic doubt. Is it totally safe? I will be going to GIR with my parents and I have a four year kid as well. I am slightly scared. The safaris are done very professionally and there is a driver and guide separate - both are assigned by the forest dept before the safari. Gir is a great place to visit for a safari because sightings are very very common, much more than the tiger sanctuaries. Wow! such a very beautiful and amazing pictures. Great and nice inforamtion. Thanks for sharing your travel experinces. Really very interesting post. I really got so useful information by reading your post, this is truly helpful. ...thanks for sharing this.